It provoked many thoughts on my part and I was just on the verge of writing about myself, so I’m linking you to it and to Sasha who does this sort of thing, with charts and stats, much better than I could ever do. And Supporting Actor is a sprawling mess o’ candidates, but Sasha makes some very salient, telling points. Main among them that you need that SAG or Golden Globe nomination first to move forward to an Oscar nomination, though not always. 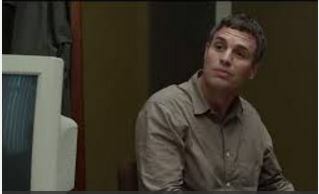 My main man to win it all this year is “Spotlight”s lead investigative reporter played by Mark Ruffalo. He has all the emotional scenes in the movie that is considered to be the front-runner all season long so far.That”Spotlight” will win Best Picture is an Oscar given. Or is it? 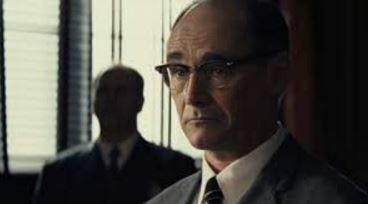 The other Mark in the conversation, Mark Rylance, for all his Tony wins, is an Oscar newcomer.He’s nominated for his complicated Russian spy in “Bridge of Spies.” Rylance has both a Globe and a SAG nod, which means he IS going to be Oscar nominated. “Spotlight” is an easy film to like and respect, but not an easy film to love, as Sasha herself has pointed out numerous times. And she’s right, again. It’s WORTHY. It’s about a topic that everyone can agree is heinous. Child Abuse by Catholic priests and the cover-up that this small group of reporters at the Boston Globe who called themselves Spotlight uncovered in the ’80s. It’s a cold film, a cerebral procedural. But is that the type of film that wins “Best Picture”? Its’ heart is in the right place, but when does a thinking man’s film about journalism win Best Picture? However,”Spotlight,” the film was not acknowledged for any of its’ players, who all decided to go Supporting. And canceled each other out of the Golden Globes and the SAG nominations by doing so. Only Rachel McAdams, in Best Supporting Actress. got “Spotlight”s sole SAG nomination.She was also the only woman on the Spotlight team of ace reporters. Yes, of course, “Spotlight” did get nominated for Best Ensemble, too, and everyone thinks it’s going to win there. Everyone, except me. I think “Trumbo” might upset in both “Best Ensemble” and “Best Actor” Bryan Cranston. Meanwhile, back to Best Supporting Actor. And here’s what I posted more or less in Awardsdaily’s comment section. Or in larger type…Still haven’t figured out how to blog properly, obviously, but here’s what I posted a few minutes ago. “After the OscarsSoWhite Debacle of last year’s Acting Nominees, they have GOT to nominate SOMEONE of color and Idris Elba is the only player seriously in the mix, or they’ll be in the same trouble all over again. With so many films to watch, films that are high on the Academy’s radar (and SAGs) will be watched first. Therefore someone like Mark Rylance could get in, because they’ll all be watching the “Bridge of Spies” screener, because it’s Spielberg. They all have stacks of DVD screeners, the Oscar voters, and they have to make choices. 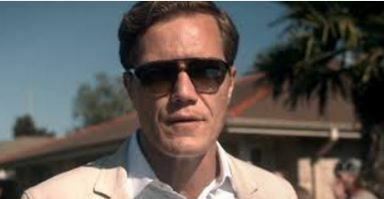 Will they get around to watching Michael Shannon’s small indie film? “99 Homes”? Will they watch it just for Shannon’s acclaimed supporting performance? Or will they skip it thinking “He’s already been nominated. He doesn’t need another nomination”? I hate to think that they think like that, but you know something? They do. And there’s very little time. And Academy voters are very busy people. They’ll all be watching “Room” which is good for the extraordinary Jacob Tremblay’s chances. It’s 50/50 whether they’ll watch the divisive “Love and Mercy.” I don’t think it was much of a performance by Paul Dano, who got nominated for a Golden Globe for Best Supp. Actor. But no corresponding SAG nod Uh-oh. And you’ve got BOTH Michael Keaton AND Mark Ruffalo floating around the edges. If Ruffalo gets nominated he could win this. As respected as Mark Rylance is, I’ve seen all his Tony-winning performances on Bway, and as good and revered as he is, he is known for getting up and reciting an obscure poem, instead of doing a traditional acceptance speech. The Tony voters don’t care and have awarded him multiple times. 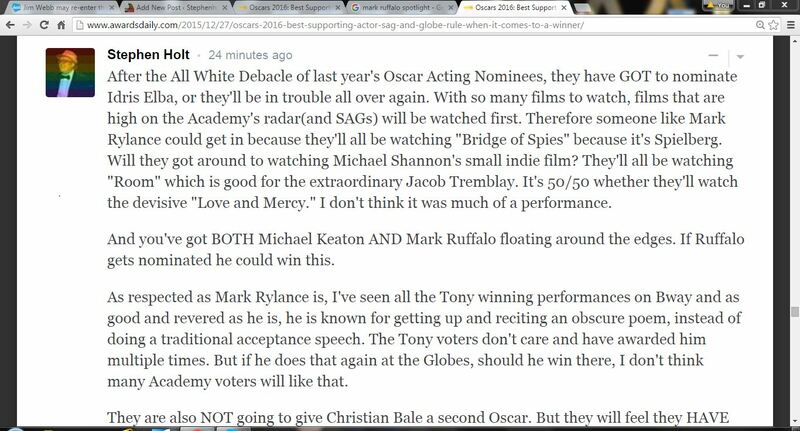 But if he does that again at the Globes, should he win there, I don’t think many Academy voters will like that. And Rylance’s is a skilled, underplayed performance. Subtle. The Academy doesn’t usually go for that in this category, especially. But they will feel they HAVE to give “Spotlight” something, besides Best Picture, which could help whoever might get nominated in this category, if ANYbody even does. Neither was nommed by the GGs or SAG. And I don’t wax nostalgic for Rocky movies or for Rocky himself. Stallone got his Oscars back in the day. For Best Picture and Best Screenplay and I think the Academy will feel that’s enough. And that they don’t owe Stallone anything.